Radical ‘feminists’ & the religious right claim this murderer is transgender. It’s a lie. Last year, a British tabloid published an article that said that one of the UK’s most notorious killers now identifies as a woman and wanted to be housed in a women’s prison. The story was used by so-called “radical feminists” and the religious right to drum up transphobia. But it turns out that none of that was true. 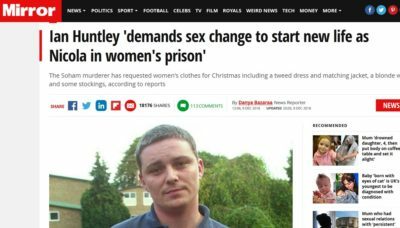 Last April, the Daily Star ran a story that said that Ian Huntley, who has been serving a life sentence since 2003 for killing two 10-year-old girls, is transgender. The story was supposedly based on an unnamed inmate at the prison where Huntley is being housed. Over the past year, the story was used by transphobes to claim that transgender women are actually dangerous men who want to harm women. But this past Sunday, the Daily Mail issued what it called a “correction,” in which it admitted that the entire story was false. 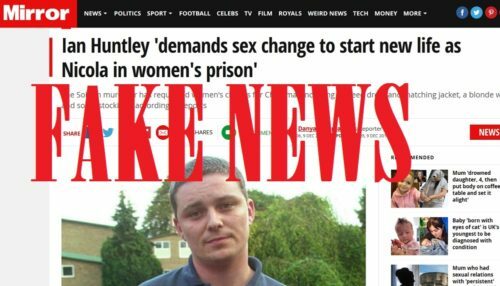 “Ian Huntley would like to make it clear that he does not own a wig, has never asked to be addressed by any name other than his own and that there has never been a plan for him to change his gender identity,” the “correction” said. The original story, which the Daily Star has deleted from its website, was picked up by other UK tabloids like The Sun, The Mirror, Daily Mail, and Metro. The Mirror‘s story is still on their website. The British government is considering changing the Gender Recognition Act of 2004 to make it easier for transgender people to update their legal documents. But, even if the story were true, it does not show that a transgender woman used prison rules to actually harm other women. And, more importantly, the existence of some bad people in a minority group does not justify stereotypes or discrimination against the entire group.